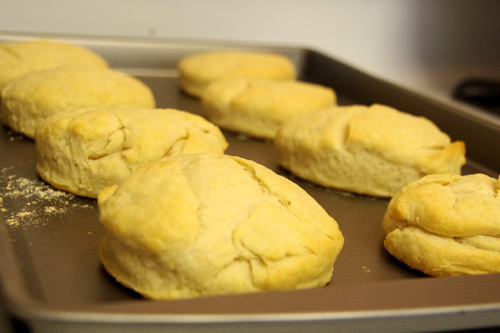 There is nothing like the taste of homemade biscuits. And when the weather turns as chilly as it is today, they are the perfect food to accompany hearty dishes like stews or soups. 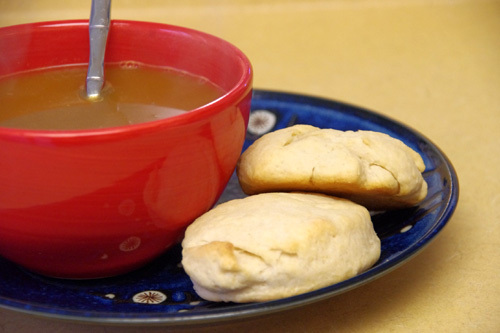 When I was a little girl, my mother made these biscuits for us with many of our meals. And now that I have a family of my own, I am carrying on the tradition. Mix together all the dry ingredients. 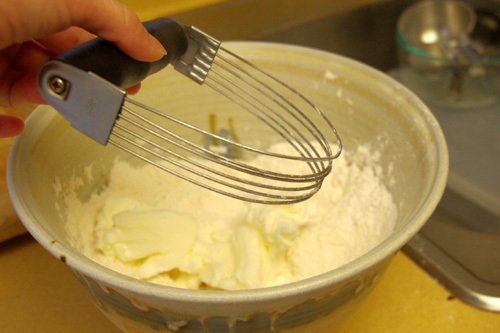 Using a pastry blender, cut in the shortening. If you don’t have one of these babies, I insist you drop everything and go get one. This magical tool is a must in all baking kitchens, and is perfect for cutting in butter or shortening, as well as mixing dry ingredients. 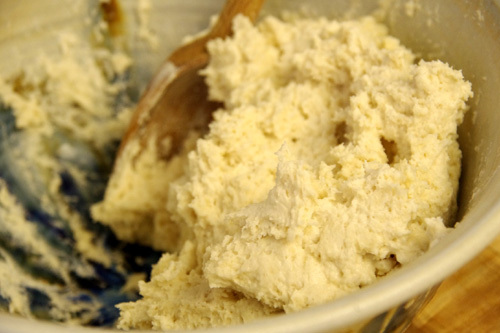 Your flour mixture should look like the above picture, the flour and shortening in pea sized clumps that form a loose dough if smushed together between your fingers. 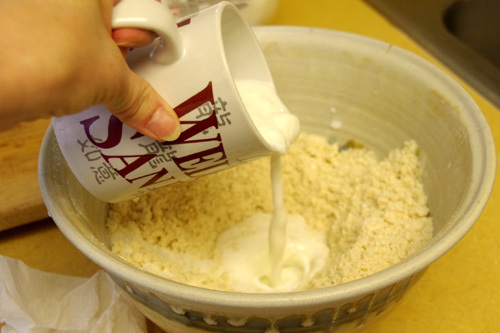 When it has reached that consistency, create a well in the center of the dry ingredients, and pour the buttermilk in. I never have buttermilk on hand. It just isn’t convenient since I have little use for it otherwise. So instead of buttermilk, I create sour milk. 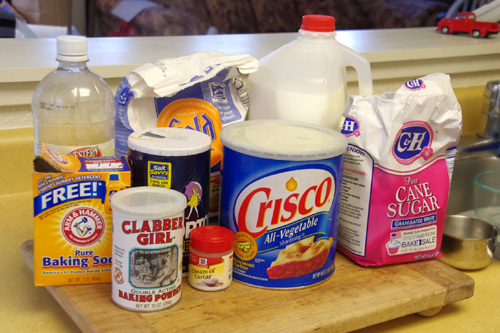 The ratio for sour milk is 1 Tbl vinegar to 1 cup milk. Since this recipe calls for 3/4 cup buttermilk, just estimate 3/4 Tbl vinegar. If you’re using sour milk, it’s best to let it sit for a few minutes to allow the milk to clump up – hence, becoming sour. It should be a little lumpy when you pour it into the bowl with the rest of the ingredients. Oh, side story. See that cup there? I am not one to usually buy San Francisco touristy items. Not only that, I have more coffee cups in my house than mouths to drink from them. So the last thing I need is another coffee cup – especially one welcoming me to San Francisco. Apparently, SF thought differently. Upon shopping in China Town, this sat at the register as I was rung up for some stocking stuffers I was purchasing. The girl thought it was mine. I insisted it wasn’t, and placed it out of her reach in a basket near the register. She distracted me, then grabbed it and stuffed it in my bag. And I didn’t discover my extra purchase until I was back home. And so it is now making its debut in my kitchen as the official sour milk holder. Thanks little cup, you did a good job. Back to biscuits. Mix the dough until just moistened. Some people like to use a fork, others (like me) prefer using a wooden spoon. Whatever you use, it is really important not to overmix, or to overknead. 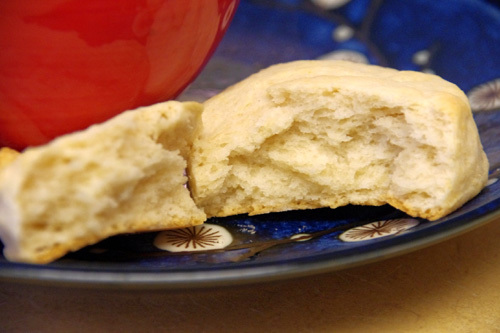 The more you work biscuit dough, the tougher it becomes. So the less handling you do with the dough, the better. And it’s ok if the dough is a little bit sticky before kneading. 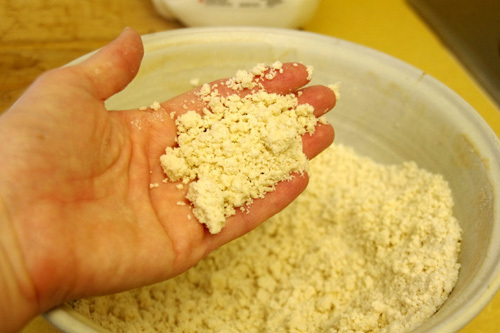 Turn the dough out on the lightly floured board. I actually don’t really knead at this point. Instead, I add just a little tiny bit of flour to the top and fold it over once or twice, flattening it each time with my hands. 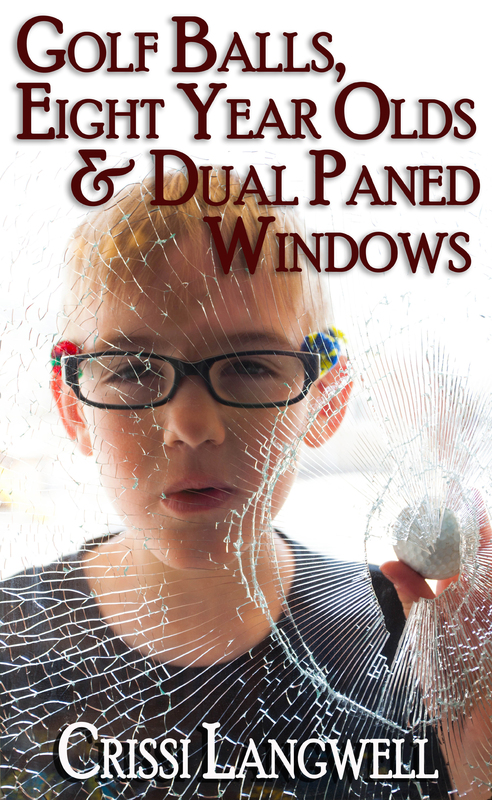 This is just to get rid of some of the stickiness. 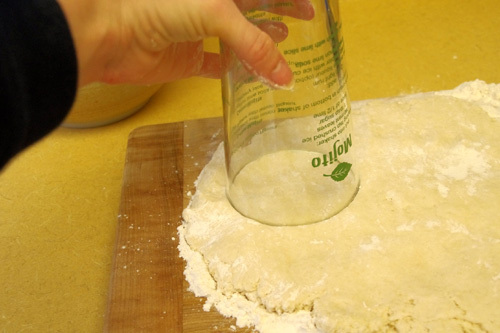 And a rolling pin isn’t really necessary since the dough will end up sticking to it and just make a big mess. 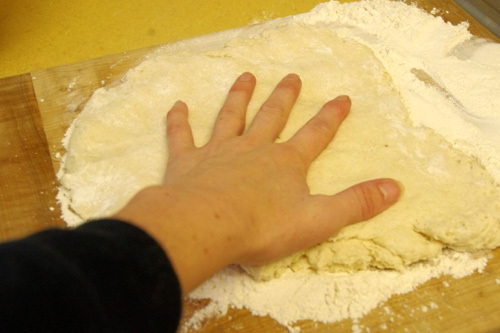 Flatten the dough to about 3/4 inch thickness. Using a cookie cutter (or a glass that tells you how to make Mojitos, like mine), cut out the biscuits and place them on an ungreased baking sheet about 1 inch apart. When you’re done, congratulate yourself by making yourself a Mojito, since the instructions are so conveniently located on your biscuit cutter. You should come up with about 10 biscuits. I came up with 8, since mine were rather large (thanks Mojito glass). 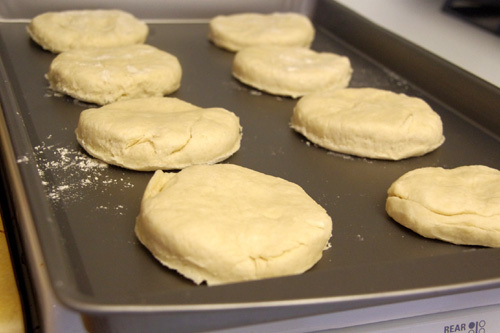 Bake at 450 degrees for about 10-12 minutes, or whenever the tops take on a slight golden brown. Note: If you increase the sugar a little, and cut them into larger circles, they make great additions to Strawberry Shortcake instead of using Angel Food Cake. FYI, if you are picking up a pastry cutter, pick up a spare one — they are the best thing I have found for squishing up avocados for guacamole. I have been making these as drop biscuits. You just pulloff a chunk of dough the size of a golf ball and place ot on the cookie sheet. 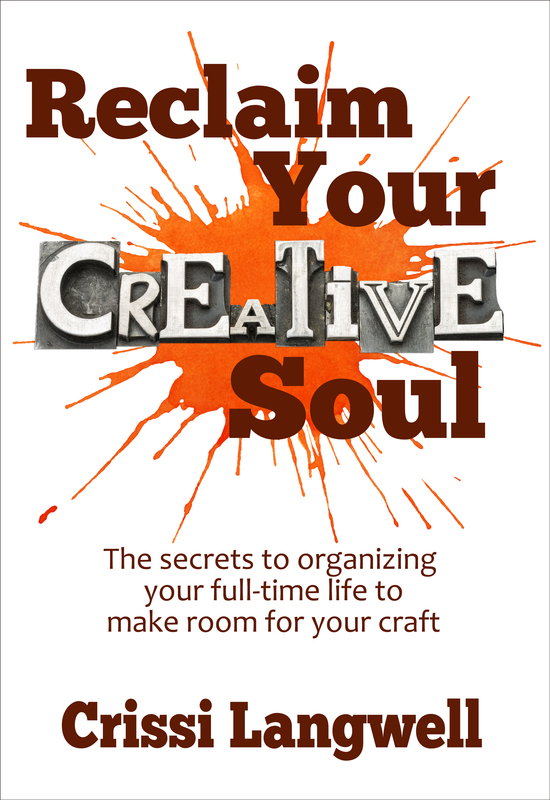 It saves time, makes less mess, and the biscuits are fluffier since they’ve been worked less. The baking time may need yo be adjusted since the dough is thicker in the middle. Str4y – totally true! And great for making egg salad sandwiches too. Heather – I’d do the drop biscuits, except I don’t think they’re as pretty. Unless, of course, they are smothered in gravy or something.